If you feel embarrassed at the loud noise associated with a sneeze and try to suppress it, think again. Your dedication to your board room etiquette can cost you much more than you could possibly imagine. Sneezing is your body’s natural reaction to eliminating harmful bacteria and germs from your system. stomach is pulled in and your diaphragm (the thin muscular sheet separating the respiratory system from your stomach) is pulled taut. Your esophagus is pulled back and is in action mode to literally 'spring’ into action and thus eliminate the germs (in the form of mucus) right out of your body. 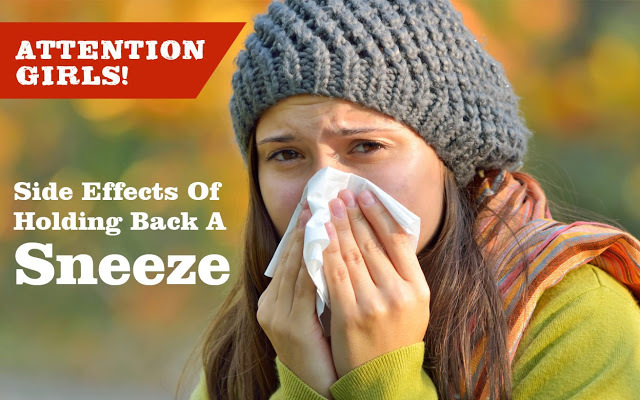 There is considerable force applied in process of ‘burst exhalation!’ When you hold back the sneeze mid-way, you apply a considerable amount of counter force to your body’s natural mechanism. This can cause you to swallow your own tongue (leading to a painful situation that can be even fatal!) or you may risk tearing the linings on the insides of the esophagus and injuring your voice box or the larynx. The suppression of a sneeze can cause massive built up pressure in our skull which can lead to bursting of ear drums, blood vessels tearing and even brain hemorrhage. In fact, there have been recorded cases of spinal damage, slipped discs and even rib cage injuries when people have been too polite to let out a sneeze amidst company. Next time, do not hesitate to let out the noise and the germs as you sneeze. Use a hand sanitizer afterwards to avoid spreading germs though. If you found this tip useful, spread good health by sharing this tip with your loved ones over WhatsApp, Facebook and other media.